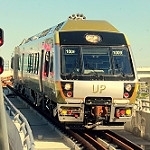 For those conference attendees flying into Pearson International Airport, UP Union Pearson Express is a train that runs directly from the airport to Union Station in downtown Toronto, which mere footsteps from the conference hotels and convention centre. As of March 9, 2016, the fares are lower than ever, at only $24 for a return trip. It's a 25 minute train trip between the airport and downtown Toronto, and trains run every 15 minutes from 5:30am - 1am daily. Please consider this environmentally conscious, cost-effective, consistently fast, transportation option!